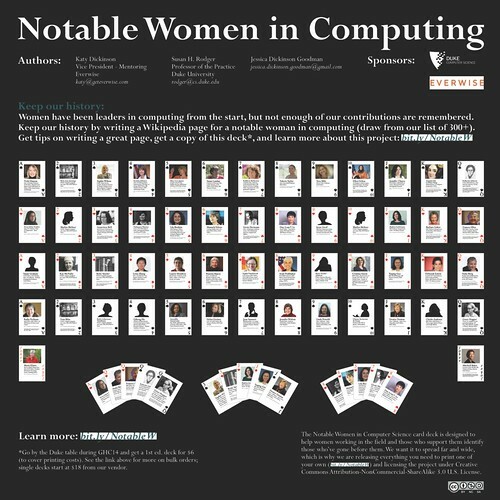 Professor Susan Rodger, my daughter Jessica Dickinson Goodman, and I created the “Notable Women in Computing” Poster and Playing Cards for delivery at the Grace Hopper Celebration of Women and Computing (aka GHC14) next week. Jessica just finished designing the poster above – showing all 54 of the playing cards. Keep our history: Women have been leaders in computing from the start but not enough of our contributions are remembered. Keep our history by writing a Wikipedia page for a notable woman in computing (draw from our list of 300+). Get tips on writing a great page, get a copy of this deck, and learn more about this project at Bit.ly/NotableW. This project and card set is associated with the long-term “CRA-W and Anita Borg Institute Wikipedia Project – Writing Wikipedia Pages for Notable Women in Computing”project. We encourage you to use this information to write or improve Wikipedia pages – especially creating new pages about remarkable women who have none! The detailed card listing is in my 1 October 2014 blog entry. Duke University and Everwise are sponsors. Playing Cards will be for sale $6/deck (our cost) at the GHC14 Duke University table – one deck per person!